Black bean salsa people, I have amazing news! This recipe that I am about to share with you is going to change your life. Ok, maybe not. But it is super easy to make and is healthy, too. You can’t beat that! My daughter is 95% vegetarian and sometimes we make this dip for lunch and just eat it with a few chips. You fill right up on those beans and avocados. Yum and Yum! 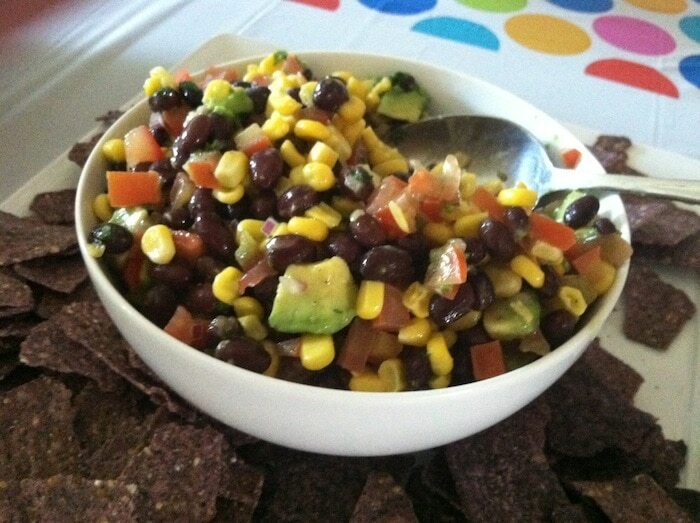 Black bean salsa is great as an appetizer, a light lunch or a meal topper! It’s totally versatile. You need to write this one down or print it for your records. Wait – do people still print recipes? If you are looking for an easy black bean salsa recipe – see below. You need all fresh ingredients, so head to store today after you see the ingredients list. Mix all ingredients thoroughly in a large bowl. Cover and chill overnight. Taste and add salt, pepper or more lime juice as necessary. Serve with tortilla chips as an appetizer, or with grilled chicken breast as a meal. What do you think about this black bean salsa recipe? Something you’d like to try? I make something like that as a side dish. Instead of avocado I use small pieces of sweet potatoe. I can’t wait to try this recipe.